The health of the Esopus Creek is critical overall to our area. It’s an asset that runs through Kingston and the Town of Ulster on its way out eventually to the Hudson River. 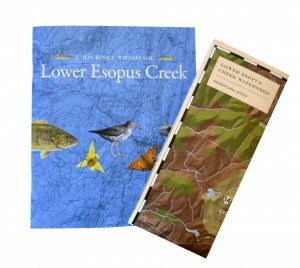 As it currently stands, there are few access points to the Esopus here at home. In most cases, it is bypassed by roadways in these modern times – making the tributary forgotten by many. Certainly, the Kingston Land Trust hopes to make it possible for more public access by teaming up with the many partners who have dedicated their energies towards the creek. Try to get to this public meeting to learn more about the recent and upcoming releases. The Ashokan Release Working Group is holding a public informational meeting on July 28th at the Town of Ulster Town Hall. The meeting will start at 7:30pm. The purpose of the meeting is to provide an update to the public about the work the group has been doing regarding the water releases that occurred this past fall and winter from the Ashokan Reservoir. Water releases made by the NYCDEP generated community concerns downstream because of the turbid nature of those releases. The meeting will provide an overview of the Ashokan Reservoir, an update on an impact assessment that is being conducted, including field visits, to follow up on a questionnaire sent out by the ARWG in May. The meeting will also describe next steps regarding the management of releases from the Ashokan Reservoir. The Ashokan Release Working Group consists of representatives from the Ashokan Foundation, City of Kingston, County of Ulster, Esopus Creek Conservancy, Federated Sportsman of Ulster County, Lower Esopus Watershed Partnership, New York City Department of Environmental Protection, New York Public Interest Research Group, New York State Department of Environmental Conservation, New York State Department of Health, RCAP Solutions, Riverkeeper, Towns of Hurley, Marbletown, Olive, Saugerties and Ulster, United States Environmental Protection Agency and the Village of Saugerties. Assist with the development, implementation and review of an assessment of ecological, physical and economic impacts of the releases that occurred from October 7, 2010 through February 1, 2011. Develop a protocol for, and ongoing monitoring and evaluation of, releases from the Ashokan Reservoir to advance the protection and improvement of water quantity and quality and provide flood hazard reduction benefits of the lower Esopus Creek. Ensure the release protocol is protective of the ecological, physical and economic interests of the lower Esopus and its adjoining communities while remaining protective of the NYC water supply. Marriage Equality Begins Tomorrow and Kingston is Ready. Tomorrow is a big day for New Yorkers – and Kingston is ready in support. Celebration Chapel, created by Kingston resident Paul Joffe is a restored 150 year old church with a pipe organ and bell – and access to a beautiful park overlooking the Hudson River. Paul’s vision to officiate gay weddings was a long time coming. He bought the property in the early 2000’s with that solely in mind. A Brooklyn native, Paul is also the founder of AFTER THE PRESS , a project that follows up on the mass media news narratives. Currently, he lives in Kingston, NY with his wife Ingrid. He is a good friend and beloved by many. “The Dig Kids” an Urban Farming Program Host BBQ in Midtown Kingston on Thursday, July 28th. The Dig Kids, an Urban Farming Program created by the Kingston Land Trust, host a BBQ in Midtown to celebrate their garden successes in 2011 on Thursday, July 28th.Citizens are invited to meet at the Everett Hodge Center at 5:00pm for a garden walk to the South Pine Street City Farm where they will enjoy Fleisher’s grass fed and organic meatshamburgers and hot dogs and a performance by the Hudson Valley Youth Chorale. Kingston – The Dig Kids, an Urban Farming Program created by the Kingston Land Trust with a grant from the Columbia Foundation and donation by Family of Woodstock invites Kingston Citizens to celebrate their success. Since May, five Kingston youth between the ages of 15 – 19 have been paid to work weekly and grow vegetables under the stewardship of Farmer Jesica Clark, a first generation organic farmer. Through the Dig Kids program, the teenagers have transformed the front of the community center while learning valuable farming skills that include garden visioning, soil construction, companion planting, harvesting and preparing or donating their vegetables. Kingston citizens are invited to meet the Dig Kids at the Everett Hodge Center 15-21 Franklin Street on Thursday, July 28th at 5:00pm for a balloon garden walk to the South Pine Street City Farm on South Pine Street for Fleisher’s grass-fed and organic meats hamburgers and hot dogs. The Hudson Valley Youth Chorale led by Executive Artistic Director Mathew Camara will perform. Donations for ‘The Dig Kids’ program for 2012 are currently being accepted. Please contact Rebecca Martin, Executive Director of the Kingston Land Trust at 845/877-5263or email rebecca@kingstonlandtrust.org for more information on the event, or how you might be a future donor or sponsors. About “The Dig Kids: An Urban Farming Program” for Youth Created by the Kingston Land Trust with a grant from the Columbia Foundation and a donation by Family of Woodstock, ‘The Dig Kids” is charged in working with Kingston youth to grow food, learn farming practices, encourage entrepreneurship, beautification, pride and good health through hands on farming experiences. About the South Pine Street City Farm The South Pine Street City Farm is an urban farm located in the Hudson Valley’s Kingston, NY. On a 1/4 acre lot, we grow produce destined for our city’s various tables. We strive to provide absolutely delicious vegetables and fruits grown minutes from their destination using responsible and regenerative growing practices. As part of The Queens Galley, all proceeds help fund the organization’s mission to provide awareness, education, relief and prevention of food insecurity in America. With our Partners The Kingston Land Trust and Binnewater Ice Co. we are building a community that values open, green and productive spaces. About Fleishers Grass Fed and Organic Meats Fleisher’s Meats carries premium products from local farmers who have raised their animals on a primarily grass-based diet or organically-raised. These animals live natural stress-free lives and are not treated with antibiotics, hormones or fed animal-by-products and therefore produce healthy, great-tasting meat, milk and eggs. We consider ourselves partners with farmers who share our standards and practices. About the Hudson Valley Youth Chorale The Hudson Valley Youth Chorale has delighted audiences since 1995 with its engaging musical presentations and sparkling musicality. The chorus captures the hearts of their audience with their pure love of singing. The singers, 3rd through 8th grade boys and girls, are drawn from throughout New York’s Hudson Valley. Their repertoire spans an array of musical styles: classical (both secular and sacred songs) multicultural folk music, popular song, spirituals, gospel and jazz. HVYC performances are often highlighted with choreography. In the case that you’ve missed it, here’s a snapshot of the issues that our Mayoral candidates are currently pressing for in the city of Kingston. There are no current issues at this time, though you can visit his WEBSITE. “A Forum for Engagement” Now Available to View Online. If you were not able to be present at the Forum on Civic Engagement on Thursday, July 14th, 2011 the program is now available online to view. “A Forum for Engagement” with panelists NY State Assemblyman Kevin Cahill, Kingston Neighborhood Watch’s Michael D’Arcy, Elizabeth Hare, ReadyCollective, Kingston Alderman Tom Hoffay, Kingston Land Trust Executive Director Rebecca Martin and Beahive’s Scott Tillit. Moderated by Brian Mahoney of Chronogram. Hosted by Stella May Theater. Farmer Jesica Clark who created the South Pine Street City Farm in Kingston to feed the Queens Galley (and our community at large) fresh vegetables for the better part of the year has expanded her efforts with a garden in Saugerties, NY for the very same reason. Currently, Jesica is searching for three HARVEST VOLUNTEERS willing to organize a regular schedule to harvest what is ready and deliver to the Queens Galley. The garden is on Route 32 in Saugerties, only 15 minutes or so from East Chester Street in Downtown, Kingston. I bet there are some fresh veggies in the deal for you, too. Please contact Farmer Jesica Clark if you are interested. She can reached at 845/380-9183. 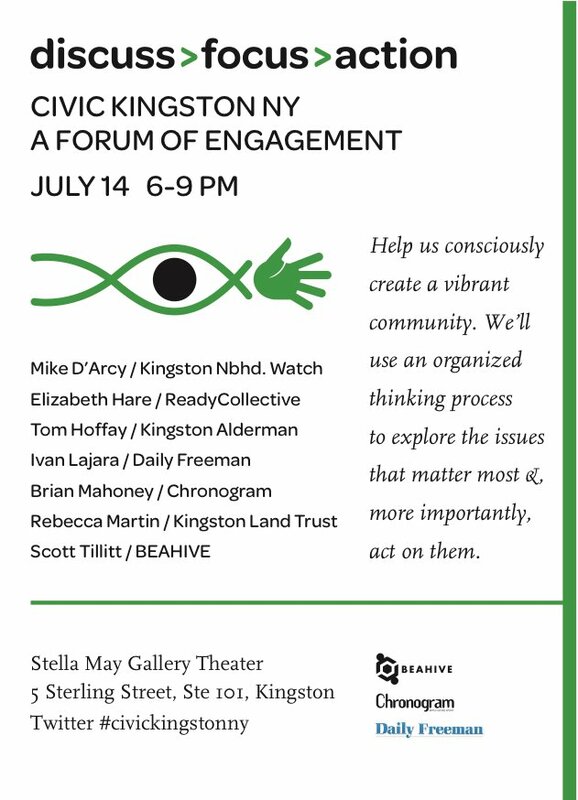 A small group of respected civic leaders, politicians and journalists will gather in Kingston on July 14 to consciously create a vibrant community. Transcending the typical panel discussion — stimulating but often fruitless — “CIVIC KINGSTON NY: A Forum for Engagement” will focus on turning vision into action. Engaging with the audience, the group will use an organized creative thinking process to explore the issues that matter most and, more importantly, act on them. Following a discussion moderated by Brian Mahoney, editor of Chronogram, the group will break to organize the discussion into major themes. Then they’ll reconvene with the audience to focus on the most important issues, break them down further into actionable projects, and form teams to work on them. 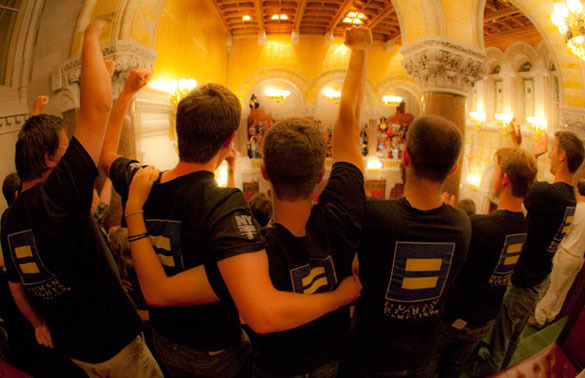 Audience members are encouraged to engage with the group in the discussion and the action-focused process. But even if you go to just listen, your presence is participation enough, the organizers stress. The group includes: Kevin Cahill, NY State Assembly; Michael D’Arcy, Kingston Neighborhood Watch; Elizabeth Hare, ReadyCollective; Tom Hoffay, Kingston Alderman; Ivan Lajara, The Daily Freeman; Brian Mahoney, Chronogram; Rebecca Martin, Kingston Land Trust; and Scott Tillitt of BEAHIVE. To bring more folks into the process, organizers will stream the event live online and monitor chat and Twitter during the discussion. Audience members and those who can’t make it can submit comments and questions before the event and follow the action live on Twitter using the hashtag #civickingstonny. The event is produced by BEAHIVE, sponsored by Chronogram and The Daily Freeman, and hosted by Stella May Gallery Theater. Space is limited. Click on the link for event details and to RSVP and join the Civic Kingston NY Facebook group to engage. BEAHIVE is a new kind of collaborative space for work and community. Its ultimate aim is to support a Local Living Economy, one that is locally rooted and human-scale. BEAHIVE opened in Beacon, NY, in May 2009 as the first such space in the Hudson Valley and partnered with Chronogram to open a second location in Uptown Kingston in December 2009.